Readers will never find a more delightful and unforgettable cast of characters. Not all of them can be named (it would be too long of a review), but readers will fall head-over-heels for: The Fluff, an Emperor penguin with a top hat and cane that's smart enough to know he needs to help fix the environmental problems that exist; Creamy, a compassionate Harp seal being raised in the San Diego Zoo; a canary named Croissant; a lovely caribou named Lauren who wants to escape her home, and the list goes on. The wide variety of animals presented have had to deal with hardship because of everything humans and industry have done to ruin Planet Earth. To address all of this neglect, the animals hop aboard a train (so magical, even Harry Potter would have been proud), called The Global Warming Express. The train makes an unexpected stop in Santa Fe, New Mexico. The Fluff tells the other animals not to get out - that whoever they're supposed to meet up with will come to the train. He's absolutely right. Two girls, Marina and Joanna (as well as their genius parrot, Inoah) hop on board to make sure this incredible adventure is recorded. The destination of their journey is Washington, D.C. They are heading to The White House to bring these issues into focus and make these people in charge understand what the problems are and how important it is that things are done before animals and habitats are basically erased. There are so many reasons to love this book. Not only is the cast unforgettable, but the subject matter is extremely important for people to learn about and address. In addition, the writer and the illustrator of this book may be young in years, but their awesome talent and passion for the subject is absolutely serious. Do not be surprised to see these girls publish more fantastic titles as time moves forward. 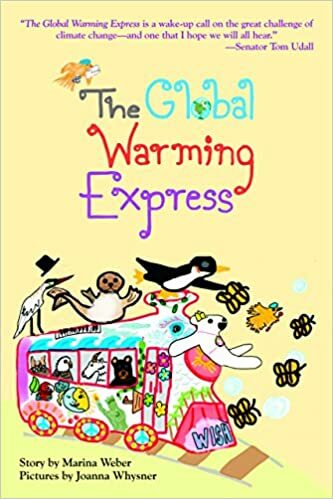 And last, but most definitely not least, is how much readers will love the organization, itself: The Global Warming Express (GWE) is a true "think tank" by kids/for kids. This is a platform that not only supplies information but also tools kids can use to make their voices heard in their own community, as well as across the globe. All ages should head to www.theglobalwarmingexpress.org in order to get a look at this great organization. And one more recommendation? Hollywood: Make this one into a movie! Quill Says: This is the perfect book to begin conversations, educate kids and parents, and even help start up school programs in every neighborhood.